“The ‘take-make-dispose’ approach is dying – it’s time for Europe to get serious about ‘recycle-repair-re-use’. Our planet is warming, species are disappearing, and resources are becoming scarcer. In a world where the population grows every day, and living standards continue to rise, we need a different economic model. We need a circular economy.” EU Environment Commissioner, Karmenu Vella. 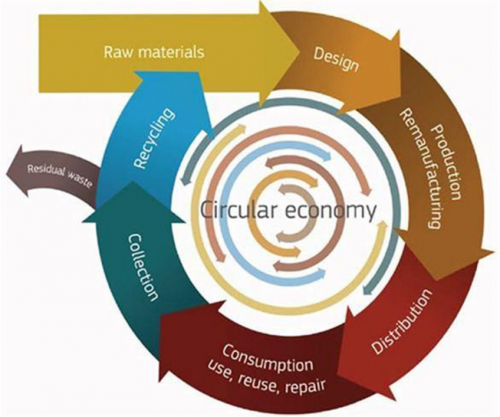 On 3 December 2015, the European Commission presented a revised Circular Economy Package which included the so-called Waste Package, consisting of four legislative proposals. Its aim is to ensure that valuable material embedded in waste is effectively re-used, recycled and re-injected into the European economy, and thereby to reduce the EU’s dependence on the import of raw materials. By promoting the prudent, efficient and rational use of natural resources, it seeks to move Europe closer to a circular economy model. Since the publication of the Circular Economy Package in 2015, EPF has taken an ever more proactive stance, focusing its work on making the case for the ‘Cascade Use’ of wood, resource efficiency and the need to prioritise the material re-use of wood over premature incineration. The work of EPF has received direct support from Commissioner Vella, who has recognised the potential of the ‘cascading use’ of wood as a key part of the EU’s future bioenergy strategy. During the work, EPF found a willing supporter in EFIC, the European Furniture Industries Confederation. The panel and furniture federations developed and co-signed the Venice Declaration, presented to Mrs Simona Bonafè, MEP and Rapporteur on the Circular Economy Package to Parliament at EPF’s 2016 Annual General Meeting in Venice. As of 2018 the Waste Framework Directive has been agreed by the Member States. The four adopted directives on waste, landfill waste, end of life for vehicles and batteries and packaging waste will usher in higher and binding European requirements for waste management. EPF believes that these new targets will support the greater recycling of wood waste, thereby creating an essential secondary source of raw material for certain panel types. Europe will thrive from these changes and wood-based panels can use them to serve as a model example of the circular economy.